Lock in a great price for Raffles Hotel Le Royal – rated 8.9 by recent guests! Customer service was excellent. Management and staff very professional. Facilities, restaurants and bars very good. Very convenient central location. Beautiful colonial building. Professional and helpful staff. New year count down party with bubbles & balloons! It's a high class hotel with the classic feel and decorates. You will definitely feel relax staying in the hotel and enjoy the Palace like feel. The location is quite good and not too busy nearby. The staff can speak English and surely be there to assist you if you have any issue with reading the address you want to go. Most importantly, the place is very clean. Service from start to finish was consistently very good. Breakfast buffet at the restaurant was amazing. Spoilt for choice. Food was very good. The hotel made a big deal about celebrating my anniversary and my bday. Not only does the resident bar have a lovely decor and setting the service was excellent and it has a great bar menu. I highly recommend the beef lok lak. The swimming pool area was a great place to relax and sip cocktails with friendly staff readily available to be at your service. Very nice and accommodating staff. Excellent buffet breakfast with lots of international choices - local Cambodian, Chinese, British, American. The room was well set up with good AC. It was our wedding anniversary and we received a room upgrade plus a really good mousse cake in the room and flower pedals on the bed when we checked in which was a very nice touch. It was an excellent place to spend our anniversary. The staff were polite and ever readily to serve the guest. Food was nice. The atmosphere of the hotel gave a sense of grandeur. Excellent Food at the Le Royal restaurant. Great staff, lovely rooms and the overall atmosphere just brings the out the old world charm! Raffles Hotel Le Royal This rating is a reflection of how the property compares to the industry standard when it comes to price, facilities and services available. It's based on a self-evaluation by the property. Use this rating to help choose your stay! One of our top picks in Phnom Penh.Blending luxury with an old-world charm, Raffles Hotel Le Royal features accommodations with a private balcony offering pool or garden views. Guests can take a dip in the outdoor lap pool and enjoy meals at one of the 2 dining options or have a drink at the bar. Free WiFi is available in all rooms. Located in the heart of Phnom Penh, Chaktomuk Conference Hall 2 is 1.9 mi away from Raffles Hotel Le Royal, while it is just a 20-minute drive from Phnom Penh International Airport. Royal Palace and the National Museum are 1.2 mi away. Spacious air-conditioned rooms at Raffles are equipped with a TV with cable channels and a mini-bar. Private bathrooms include a hairdryer, bathrobes and free toiletries. Guests can approach the 24-hour front desk for use of meeting rooms and banquet facilities. Other facilities include a business center and a tour desk. 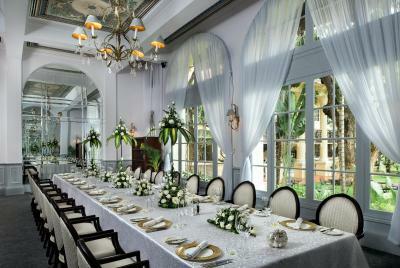 Raffles Hotel Le Royal also provides a toll-free Global Events and Meetings Solutions service. Restaurant Le Royal serves up modern French and Khmer dishes, while Café Monivong features all-day dining with buffet and a la carte options. 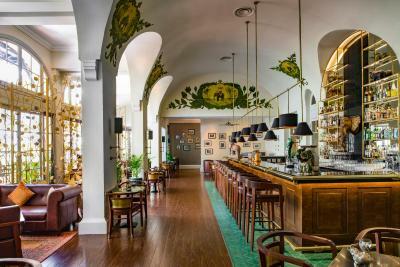 Drinks and light snacks are served at Writer’s Bar, Elephant Bar and Poolside Terrace. 24-hour room service is also available. When would you like to stay at Raffles Hotel Le Royal? Rooms offer views of beautiful tropical gardens and the swimming pool from the private balcony. Located in the main building, this spacious room features a blend of Cambodian and art deco themes. Includes a large bedroom and separate sitting room and kitchenette. Newly renovated rooms overlooking the tropical gardens and swimming pools. It is fully air-conditioned and equipped with an in-room safe, a minibar and a cable TV. This double room features a balcony, bathrobe and pool view. House Rules Raffles Hotel Le Royal takes special requests – add in the next step! Raffles Hotel Le Royal accepts these cards and reserves the right to temporarily hold an amount prior to arrival. Did not get the room we booked and the said that we were being up graded but it looked /felt more like a down grade. F&B by the pool was not good standard Spa service was sub standard. Therapists were not that experienced but they charged way too much for what was delivered . A unique building, with nice facilities and I had characterful, comfortable room. The staff were all very welcoming, polite, and efficient, yet still relaxed. A very pleasant atmosphere. On arrival checking in with no credit card was awkward. Elephant bar, we came into the bar one evening at 11o’c for a nightcap after being out for dinner. We were surprised at the clientele in the bar as it was very obvious there were several white men who had invited “paid” companions into the hotel. This was not what we expected in a 5* hotel and made us feel quite uncomfortable. A disappointing end to an otherwise pleasant stay. The room was a little tired, but I understand the hotel is to undergo refurbishment later this year. The telephone in the room wasn't in working order and the check-out experience could have been improved upon (my pre-booked transfer wasn't ready despite my having confirmed it the evening before, the concierge couldn't be called for the luggage collection due to the phone in the room not working, erroneous charges on my account, and the argumentative member of staff on duty at the time). Beautiful building, nice pool, pleasant staff and fabulous Elephant Bar. The property is beautiful - especially the heritage building; the pool is great; the staff so attentive and friendly; the food's great; the whole experience 5 stars. Would have been more convenient if there was a mini mart nearby or in the premises. Some of the sockets in the room I stayed doesn't have power, I need to unplug the light's plug to charge my phone and power my laptop. It's a nice room for relax, and will makes you less hardworking if you are there for work.